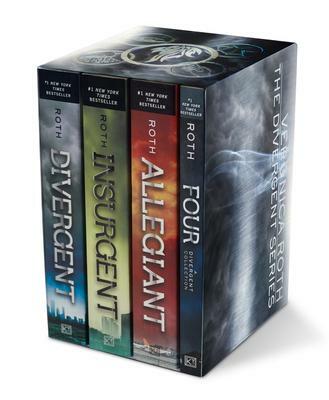 The definitive box set for Divergent fans! This four-book set includes paperbacks of the three books in the #1 New York Times bestselling Divergent trilogy, plus the companion volume told from the perspective of the immensely popular character Tobias, all wrapped up in a dazzling keepsake box. This set is perfect for established fans who want to own the full Divergent library, readers new to the series, or fans of the blockbuster films starring Shailene Woodley, Theo James, and Kate Winslet. Divergent One choice can transform you. Veronica Roth's debut is a gripping dystopian tale of electrifying choices, powerful consequences, unexpected romance, and a deeply flawed "perfect society." Includes bonus materials by Veronica Roth. Insurgent One choice can destroy you. The second bestseller continues the dystopian thrill ride. As war surges in the factions all around her, Tris attempts to save those she loves--and herself--while grappling with haunting questions of grief and forgiveness, identity and loyalty, politics and love. Includes bonus materials by Veronica Roth. Allegiant One choice will define you. The explosive conclusion to the #1 New York Times bestselling Divergent trilogy reveals the secrets of the dystopian world that has captivated millions of readers. Includes bonus materials by Veronica Roth. Four: A Divergent Collection A companion volume to the worldwide bestselling Divergent series, told from the perspective of Tobias. The four pieces included--"The Transfer," "The Initiate," "The Son," and "The Traitor"--plus three additional scenes, give readers a fascinating glimpse into the history and heart of Tobias, and set the stage for the epic saga of the Divergent trilogy.